Liz, 58 is an Office Manager from Surrey. 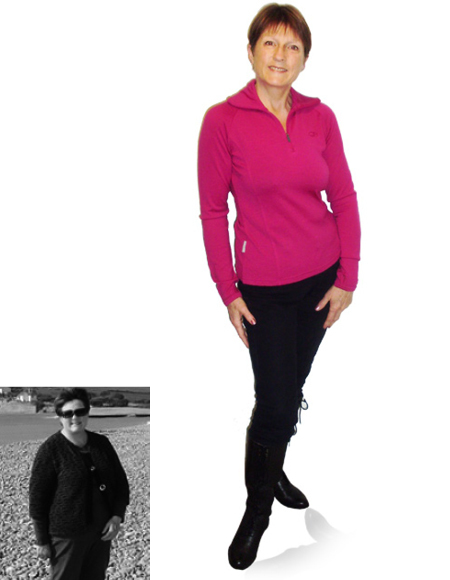 She joined Nutracheck in September 2010 and has lost an incredible 6 stone over 15 months. Liz says "I had an original goal of 10 stone140lbs63.5g and reached that in July this year but after maintaining for the next 5 months my weight appears to have settled at 8 stone 13lbs125lbs56.6g". I had yo-yo dieted for years (and I mean years). I did not want to be fat at 30, then 40, then 50 and then... oh my goodness, I was getting too near to the 60 mark! (58 at the moment) So it just had to stop. But where to start - I trawled the internet over and over again looking at all sorts of weird and wonderful sites and suddenly I found Nutracheck. It was like a breath of fresh air, it just made such good sense to me. Many years ago I trained as a Weight Watchers lecturer and had a couple of classes of my own. It was successful, however my youngest son was quite ill and I could not commit to the classes so I gave them up. However I did not wish to use Weight Watchers again. I do not like the pro points system and I was not happy with attending a weekly class - I needed to do something that was far more flexible for me and my lifestyle. The forums and the food diary without a doubt. I use the food diary religiously even though I am maintaining and I still spend time (far too much!) on the forums. I am so grateful for the support, advice, humour and general camaraderie that prevails with all the fab people on there. I feel confident now, my self esteem is where it should be. How easy did you find fitting the diet into your lifestyle - has it made you adopt a healthier way of life? No problems at all with fitting into my lifestyle - there is only me and hubbie and I trained him many years ago to eat what he is given! No on a serious note he is an extremely supportive chap. As for healthier, I don't think my diet has ever been so healthy. I always had a good understanding of what I should and should not be eating, but when you are faced every day with a food diary showing just what is going in your mouth, it has to make you think. Also I have found my love of running and all sorts of other gym classes - I just love exercise now! I did this journey just for me, not for any specific success milestone. However going from a size 20/22 to a size 10 has been an extremely pleasing and enjoyable thing. I also have a two year medical with my company and at this year's medical the clinician and the doctor just could not believe I was the same person - everything was completely 'normal' and that included a heck of a lot of tests! That was a huge boost and felt extremely good. Confident, my self esteem is just where it should be. I no longer feel that I have to wear a huge smile to cover my huge body. I have bags of energy and I am HAPPY! I tend to ensure that I plan carefully for all eventualities, but as we all get down from time to time, I now find that either exercise (especially a brisk walk if I am a little low) or some daily meditation will keep my mind in its right place. I don't fret if I have a poor eating day because I know exactly what I have to do to get myself back on track. Nutracheck has taught me all the lifestyle skills I could possibly need to keep my weight steady and constant - Thanks Nutracheck! !